In less than two weeks, I am humbled to provide the closing keynote talk for a group of LGBTQ Resource Professionals (and allies) at the Consortium Summer Institute. Coordinated annually by the Consortium of Higher Education LGBTQ Resource Professionals (the Consortium) in conjunction with North Carolina Central University and the National Black Justice Coalition, hundreds of college and university professionals convene for professional development, capacity-building, and strengthening connections. This year’s theme, “Strategies for Resistance, Resilience, and Hope: Supporting QTPOC on College Campuses”, (QTPOC: queer, trans, people of color) is timely given the state of political resistance and activism on college campuses, as well as the intersectional lens necessary to respond to and cultivate these social movements. Hosted in Durham, North Carolina this year and in the context of our current political context, college professionals will have much to discuss and share in preparation for the impending return to respective campuses. 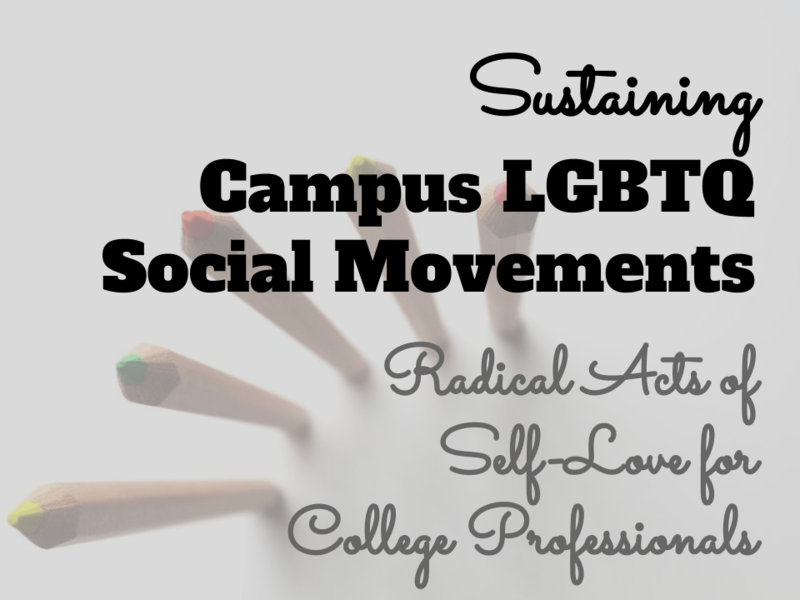 There is an overwhelming abundance of issues, incidents, and strategies regarding the current and future state of LGBTQ students, staff, and faculty. With ongoing acts of violence towards LGBTQ individuals and concerted efforts to reduce the life opportunities of LGBTQ communities, we are reminded that even allyship and actively resisting interpersonal, institutional, and systemic oppression can have dire consequences. This week has been very mixed regarding points of pride and celebration for me as an individual and a member of our larger social fabric. As a mixed race person of color, lesbian-identified and gender nonconforming individual, observing the intersectional and interconnected dynamics of racial, gender, and sexuality-based systems of oppression is a daily reality rather than an abstract concept. The subversive ways in which classism, racism, and sexism are deeply embedded in my daily experience are a consistent reminder that there is much work left to be done, many dialogues across difference that need to be had, and that resilience in spite of these experiences is a necessary and vital ingredient for thriving communities. In this season of college graduation ceremonies, we have seen how alive campus activism really is. One hundred students walking out during their Notre Dame commencement ceremony as Mike Pence spoke on May 21. Additionally, we saw the fierce and courageous demonstration of graduating students at Bethune-Cookman College, a Historically Black College and University (HBCU). After collecting over 50,000 petition signatures from students, staff, faculty, and community members to remove Betsy DeVos as their commencement speaker and seeing no action on behalf of college administrators, they leveraged the power they had in collective demonstration during the ceremony. As a beautiful mass of bodies of color, they literally turned their backs to DeVos while she spoke. College administrators made hollow threats in an attempt to silence and condemn their actions, with little effect. Supporting the actions of these students (from an outsider’s perspective) took the form of faculty-led efforts to coordinate the student action and consequently noted in the “Open Love Letter to Bethune-Cookman 2017 Graduates from Black Faculty”. Soon, I will speak to this group of LGBTQ and ally college professionals who hold a deep awareness of the interconnections people of color, queer, and transgender individuals experience in higher education contexts. They will convene to breathe in inspiration from one another, collectively exhale, then return to their campus once again to fight the good fight for LGBTQ students, staff, and faculty. What I hope to offer attendees are points of reflection and strategies for radical self-love as they support and advocate for LGBTQ inclusion on their respective campuses. I hope to speak directly from my experiences as a QPOC (queer person of color) higher education professional. As college professionals in identity-based capacities, we often share many of the identities and experiences of the students we’re advocating for. Within this context, self-care (and radical self-love) can often take the back seat to the pressing needs of these selfless advocates. I hope to offer a gentle reminder that the work they do for others is vital to the wellness of today’s student leaders, scholars, and activists and that I am personally invested in ensuring college professionals are thriving in their relentless pursuits. This investment in college inclusion professionals is directed towards a vision of sustainable professional pathways for these professionals, who in turn cultivate the endless talents and possibilities of tomorrow’s LGBTQ and QTIPOC (Queer, trans, indigenous, people of color) student leaders.